The most affordable recreational sculling boats in the USA, a rowing boat for all ages and all experience levels. A real rowing boat at an affordable price. We love Edon TS515 rowing boats with their fast streamlined but stable hull, they are light and easy to row and they come complete with removable pontoon stabilizers that keep the boat from flipping when learning or when rowing on cold water. Made of tough polyethylene that is damage resistant and unaffected by UV the Edon TS515 is the perfect rowing boat for exercise and fun, whether you are an experienced sculler or just starting out. A proper sculling boat at an affordable price. Edon TS515 sculling boats from the Virginia Rowing Company. Hull shape is important, too short and too wide and the boat is slow, too narrow and it becomes tippy. 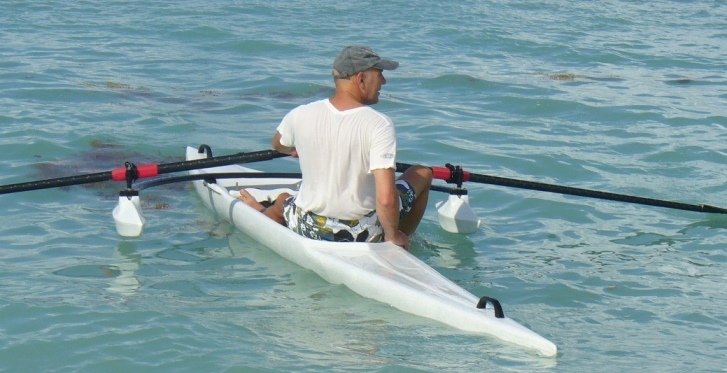 The Edon at 17 ft long and 2 feet wide is ideal for getting that real sculling feeling in a recreational boat. A round bottom is essential for speed and enjoyment, flat bottomed wide boats become a chore to row. The Edon's removable pontoons make the boat safe for all ages. Most rowing boats are fragile and expensive to repair and maintain, Edon rowing boats are made of light weight polyethylene, are very robust, resistant to UV light and very low maintenance. Rower weight of up to 240lbs, light and easy to car top or move around. 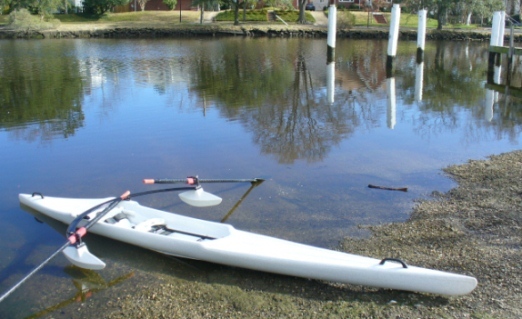 The perfect recreational sculling boat for all skill levels. Check out the other wonderful features of the Edon TS515 sculling boats by clicking on the menu at the top of the page, the most affordable recreational sculling boats in the USA. Small fast rowboats can be tippy, Edon TS515 rowing boats come complete with removable pontoon stabilizers for extra stability, they don't impede the performance or enjoyment but do help to keep you safe by stopping the boat flipping if you make an error. For rowing clubs and camps they also help to meet an organizations duty of care obligations when teaching young people and you get a higher retention rate from your learn to row classes. Made in New Hampshire, Dreher make some of the finest quality rowing oars in the world. The standard hatchet style sculling oars that we recommend and sell with Edon sculling boats are affordable yet high quality, made from 100% carbon fiber, extremely light yet very strong and durable, ideal for rowers of all standards and suitable for nearly all sliding seat recreational sculling boats, rowboats and racing shells. 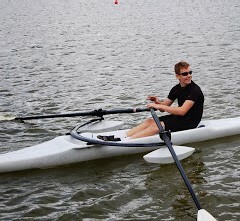 An optional extra for the Edon sculling boats and for most other sliding seat rowboats and rowing shells is to upgrade standard oarlocks to the Magik oarlock. Made in Australia these oarlocks have a patented system for holding the oars against the oarlock so that there is no slop between the two, accurate positioning of the oars and more positive connection with the water and faster starts. Click on the picture at the top of the page for more information. Above - Edon TS515 sculling boat with the pontoon stabilizers removed. Rowing boats, sculling boats, rowboats. What's in a name? We use the terms sculling boat, rowing boat, rowing shell and rowboat interchangeably, in the context of our products they all basically mean the same thing. Technically a rowing shell does not have a keel, just a skeg (fin) and rowers in a sculling boat have 2 oars each. Folks talk about going rowing and it can mean rowing with 1 oar or 2, most people use these terms interchangeably, it's confusing but really doesn't matter. Why sliding seat rowing boats. Fixed seat rowing in boats such as wherries and guide boats doesn't make a great deal of use of the legs but these are the strongest muscles in the body. Sliding seat rowing boats allow the use of the legs by moving the body back and forth on a wheeled seat, this also means that the oarlocks have to be spread further apart as the arc of travel of the oar handle is greater and consequently these sit on a wide rigger either attached to the sides of the boat on top. The combination of wide apart oar locks on riggers and a sliding seat means that the boat can be rowed a greater distance each rowing stroke and with more energy than with fixed seat rowing boats. Rowing works all the major muscle groups and is good cardio exercise. Don't worry that you think you are not fit enough to row, as you learn and your rowing technique improves so will your fitness allowing you to spend more time on the water which after all is what it's all about. We are always happy to talk about rowing and in particular about our very affordable Edon TS515 sculling boats. Just call or email and we will do our very best to answer your questions. Being in a rowing boat that's moving through the water, it's so clear. Everything falls into place in terms of what's important and what's not. Rowing is not only good for the body, it's good for the mind. Gliding across the water propelled solely by your own effort and contained in a sleek rowing boat not much wider that you are, heaven on earth. Edon TS515 recreational rowboats. 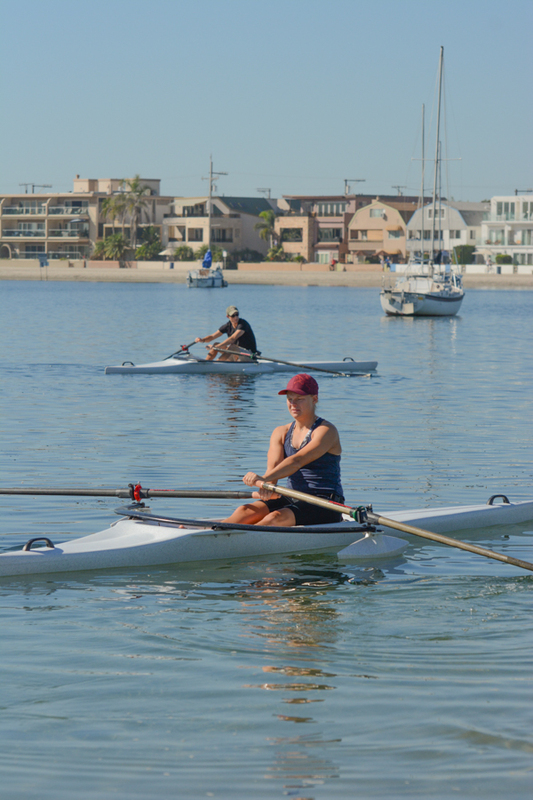 The most affordable sculling boats available in the USA.